I've had the privilege to work with many artists in the founding of two record labels over the last 12 years -- Silent Planet and The Pop Collective. I continue to sell that music here. Below are some of the best introductions to what we did as a label, in that these records are compilations of various artists both on and off roster. For an excellent introduction to the work of Silent Planet Records and its artists, I recommend the two samplers released by the label. Both give an insight into the label's mission (promoting acoustically grounded, lyrically intelligent, and spiritually provocative) and a good sampling of each artist's music. Each also contains some unreleased tracks. Beat also includes a bonus CD of the radio show we produced for a time called Wide Angle, hosted by John Fischer and brimming with music and insightful commentary and artist interviews. I love the packaging of both these releases (done by the very talented Dave Danglis) and particularly enjoyed writing the text -- an attempt to provoke thought about art and faith. Even after several years, these records hold up well. 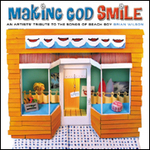 Making God Smile is Silent Planet Record’s 2002 musical tribute to the songs of Beach Boy Brian Wilson. The CD package, containing seventeen all-new renditions of some of the Beach Boys' and Brian Wilson's best-known music, also includes a full-color 24-page booklet. The booklet includes write-ups from each of the artists, commenting on the song they chose to cover, and on Brian's influence. Artists include Phil Keaggy, Sixpence None the Richer, Randy Stonehill, Kevin Max, and Kate Campbell, among many others. The songs were selected from the hit catalogue of virtually unparalleled Beach Boy and Brian Wilson songs. Each track was recorded specifically for the Making God Smile CD to celebrate Brian's 60th birthday and, simultaneously, to acknowledge his lifetime of exceptional work. Conceived by Silent Planet Records President Steve West, Making God Smile immediately grew into a stunning collection of songs performed by a variety of artists from just about every genre of music. Included are platinum-selling performers, songwriters, first-rate sidemen, Grammy nominees and other professionals, each impacted by the exceptional music of Brian Wilson. "This album is a gift to Brian on his 60th birthday, from many artists who have been profoundly influenced and touched by his music over the years," said Steve West. "The album title -- Making God Smile -- is both a nod to the legendary and unreleased [original] SMiLE recording and a recognition that music serves a higher purpose, a healing purpose, as Brian so often said." I love this record. My label manager, Tony Shore, and I handpicked each artist and each song, asked them to record it on their own and send it in, and then we sequenced and had the whole collection mastered. I'm amazed at how it turned out, given this process! It was the label's swansong, and a fitting way to finish. When I asked Brian Wilson what he thought of it, the man of few words said "It's great!" When my cohorts and I at Silent Planet Records created Making God Smile: An Artists' Tribute to the Songs of Beach Boy Brian Wilson, we had so much good material that we could not fit it on one disc. So, in order to honor the man and the artists who donated the songs, we released the 2-disc version of the recording on the internet only. It quickly sold out. Many people have requested the nine songs on the bonus disc, so many that we now refer to it as the "lost" album (shades of the original Smile), so we make them available here for those who have purchased the single disc version and want "the rest of the music." Another of my favorite projects, this album was culled from some great perfomances by both Silent Planet and other artists from the several years when the label hosted the Acoustic State at Cornerstone Music Festival. Ah, I can feel the dirt, the heat, and mud from that patch of cornfield west of Peoria, Illinois now! But the best part of C'Stone is the great music -- much of which was on our stage. There are 13 artists here and 18 tracks, everyone fromTerry Scott Taylor to the Lost Dogs to Aarron Sprinkle to Tom Prasada-Rao. There rae funny moments too, as wehn Phil Madeira introduces his song with a humorous story of the goings on around C'Stone. God bless him. It takes me back. Enjoy a piece of history with this record. Here's a good one by Brooks Williams called "Love came Down:"